I’ve seen tons of posts around the blogosphere regarding family foods, so when I went home and discovered my mom had all the ingrediants for a Filipino feast for the weekend, I figured it must just be that time of the year. Growing up, I remember my mom would have "Filipino Get-Togethers" that were basically all-day pot luck events where we’d all gather at one person’s house, bring lots of good Filipino food, and sit and talk and eat all day. We did these events more when I was younger, so I don’t remember too much about them, except for the foods. I do remember one house we went to rather often was one of my mom’s friends’ houses. The friend had a huge pink house with tons rooms. My sister and I hung out in the finished basement of the house with the other kids where we played video games (probably Nintendo – the original) and other kiddie games like tag. The friend had about 15 sons (ok, that’s an exageration, it was more like 5) so take that, plus us, plus the other kids and no wonder they stuck us in the basement! We liked it down there, though, because we could just be kids without listening to the "boring" adult-talk. I remember I made fun of the son who was my age because he lived in a pink house, not because it was that funny but because he got all flustered. I don’t remember too much about the playing with the other kids, but I sure do remember all the yummy food we ate for hours. Ahh…those were the days. Luckily, thanks to my Filipino heritage, I’m able to relive those days through my family by cooking those favorite dishes I grew up with. We were celebrating my mom’s birthday this weekend, so we cooked a few dishes traditionally served for special events. We made Pansit – a dish with thin rice noodles, vegetables, pork and chicken. 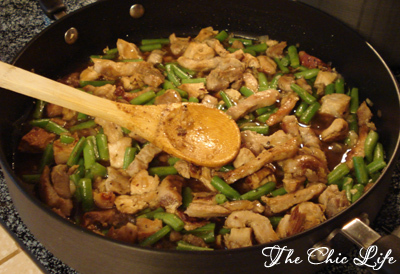 Here, we’re just cooking the pork, chicken, and green beans. Pansit is one of my all-time favorite Filipino foods. Here, we’ve added all the ingrediants and are just finishing the noodles. 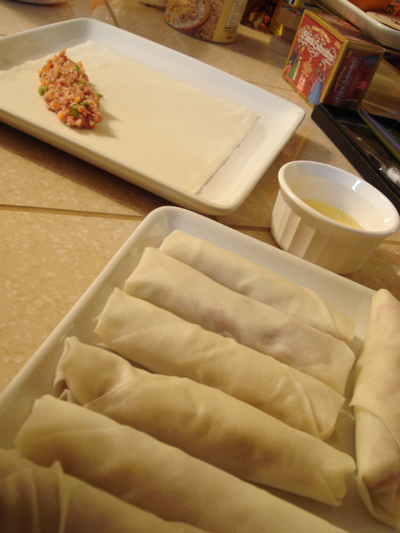 We also made lumpia, which is like a Filipino spring roll. 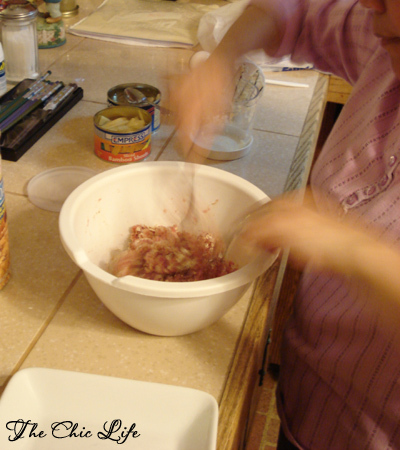 Here, my mom is mixing the filling, which is made with pork, water chestnuts, bamboo shoots, and whatever else my mom feels like putting in the mix. I was actually in charge of preparing the lumpia. I filled and rolled the lumpia, and then we fried them in vegetable oil. 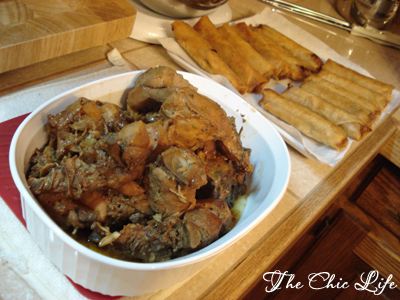 So, as you can see, we had quite the feast, with our pansit, lumpia and (pictured here) chicken adobo. Here’s my plate – Round 1. I love trying foods from different cultures. 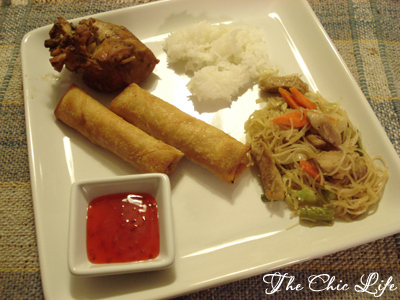 From that photo, I can almost taste the "spring rolls" now with some duck sauce for dipping – yummmm!!! Those dishes are amazingly beautiful and look so delicious. I saw the "pants off" at the subway and am a bit relieved it's done by "agents." The pansit looks absolutely delish! 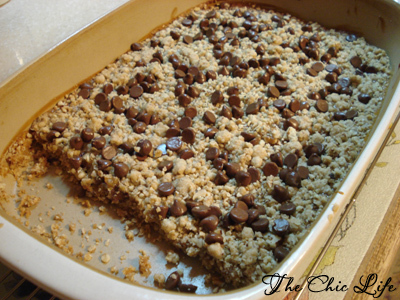 I'm thinking perhaps the chocolate rice could also be served as a "treat" hot breakfast cereal — yum!